With lots of people collaborating together, as the admin you may want to organize the workspace and adjust all of your workspace members' permissions. You can enter your workspace settings by clicking on the workspace name in the top left corner and selecting "Manage [WORKSPACE NAME]". On the Settings page, you can change the workspace name, billing email address, VAT number, and workspace avatar. Here, you can also select who members can invite via the drop-down menu. You can choose whether or not guests will automatically deactivate after 14 inactive days (if you have guests enabled in your workspace). Just below the invite permissions, you'll see 'Share Link Permissions'. Choose to enable/disable anonymous editing by checking/unchecking the box. 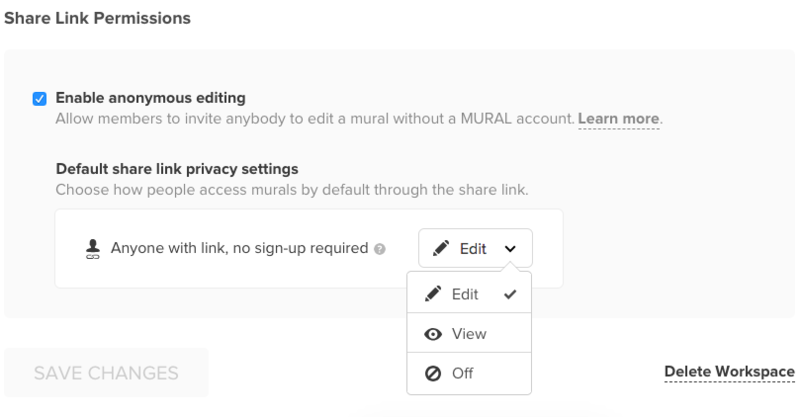 Decide whether someone using the anonymous link will be able to edit, view, or not enter a mural at all. - Select multiple members and guests to make bulk actions such as delete them from the workspace, or change their permissions. 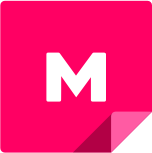 Via the 'Members' management section, you can also remove users altogether, or invite new ones. See more about the specific permissions someone can have in a workspace, here.